The person asking the question is usually pointing to the least expensive motorcycle helmet on the shelves and then to the most expensive one we have out. The first thing to go through my mind is “The price!” jokingly of course but it occurs to me that a lot of people genuinely don’t know why one bike helmet would be priced over another one. And there’s loads of reasons why one helmet could be more expensive than another. Or rather – why that helmet with a bigger price tag is worth more. What is the helmet’s purpose? The first reason is the purpose of the helmet. In my opinion it’s the most important difference as it can affect so much and change the helmet’s value before the helmet is even made. Depending on the helmets purpose, it can change everything from the materials the helmet will be made from to where it is made, how it is made and the level of technology that’s going into the helmet. For example – a helmet that’s purpose is to be an entry-level lid is going to be designed to be cheap, made from easily accessible and workable materials and have the most basic padding with none of the bells and whistles. You might get an internal sun visor at most, maybe even a pinlock ready visor. 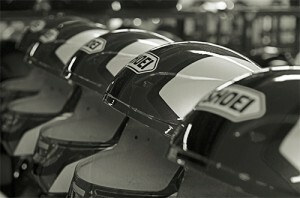 The idea is that it’s easy to afford for new riders or people who want a quickly obtainable lid for normal road speeds. However if the purpose of the helmet is for racing- it’s already going to be an entirely different animal. It needs to be made from stronger, lighter materials to handle impacts at higher speeds, materials that are more difficult to work with and the best padding out there for rider focus. They’ll need to cram in all of the bells and whistles they can get away with into the helmet so that it gives the rider an edge. Can you see how it all adds up already? 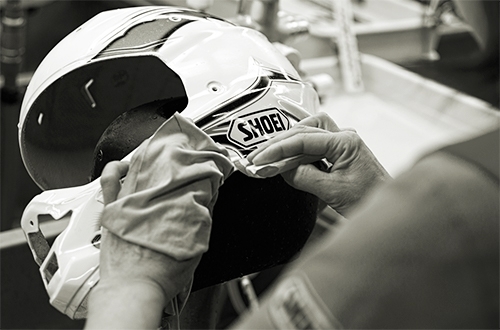 The shell material and how it’s made can count a lot toward the cost of a helmet. For a £30 helmet it’s likely made from thermoplastics- Tough plastics heated up until it’s a melted goo then injected into a mold where it’s cooled. Open up the mold and ta-da! You have a shell- made in minutes. 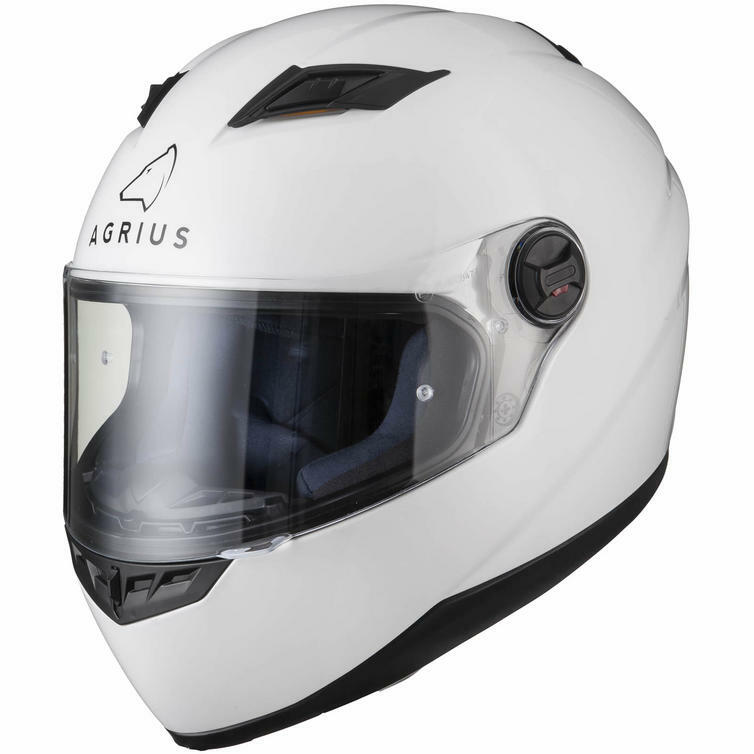 For the more expensive helmets you may not be dealing with Thermoplastics or Polycarbonates. It could be fibre based like Fibreglass, Carbonfibre or a composite of several fibre based materials. These materials are much more difficult to work with- unlike thermoplastics where it’s all done by machines- fibre based shells are all made layer by layer by people. You’re actually paying someone’s wages to give you a stronger and lighter helmet. Take Shoei for example- their shells are made by hand and one person oversees the entire construction of a shell so that only one person can be held accountable for it. If you were to pull everything out and just have the shell left over- you’d be able to see that employee’s seal of approval inside it. So if that shell was imperfect in any way, that employee was entirely responsible. 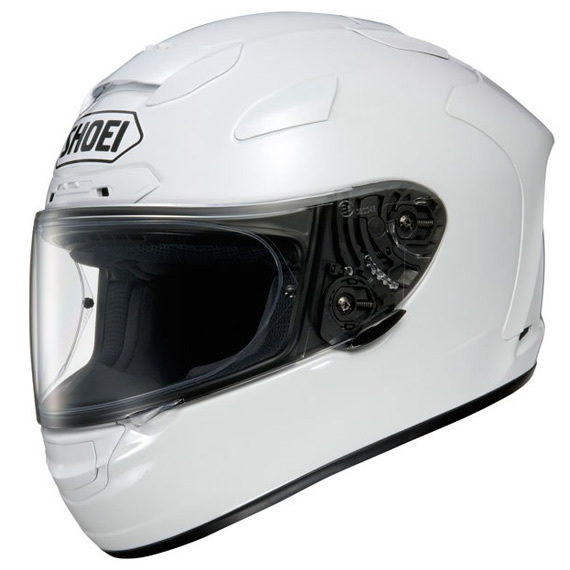 In Shoei’s case you’re not paying for a machine made bit of cold plastic. You’re paying for professional handmade craftsmanship from Japan with the best materials out there. I think this is a good point to end this entry here, I don’t want it to take a million years to read. I’ll include the many other reasons for the price difference between helmets in a part two soon where I’ll go into points such as the EPS liner, the padding, the visor and the other fun stuff you may or may not get in your helmets. Thanks for reading, everyone! Until next time!